When working on large tables it’s always advantageous to have the headings as well as the margin lines visible, as it makes reading the table an easy task. Even when you scroll through the table you have the headline and other explanations intact. The newer versions of Excel have the same function for fixing particular areas in Excel as in the old versions, but it has been updated. Even the location of the command has been changed in the menu. 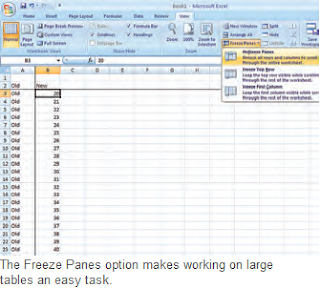 To Freeze Panes, place the cursor at the left hand corner of your data, for instance place the cursor on B3, if the rows 1, 2 and the column A has to be fixed. To Freeze Panes go to ‘View’ then click on ‘Freeze Panes’. Additionally, in the new version you also have the option to just Freeze Top Row or the First Column. When you no longer need it you can click on the option ‘Unfreeze Panes’.